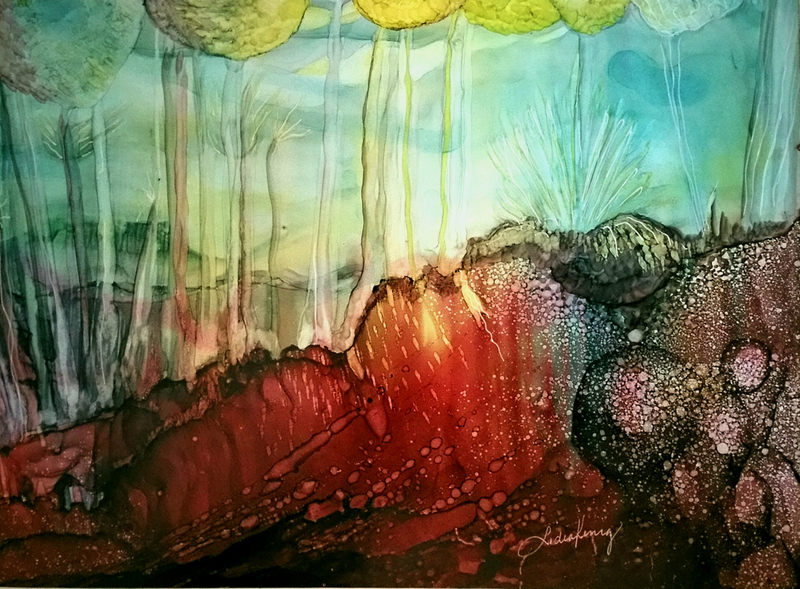 In this alcohol inks painting on Yupo paper, the landscape is teeming with life. Earth and sky are engaged in a mystical dance with such synergy that myriads of suns appear and merge with towering mountains in a joyful embrace. The love of surrender is palpable and the intimacy of the touch feels sublime. The painting is the embodiment of the creative process, regardless of what and how we create. It portrays how to live our lives creatively. Living life creatively means that when the yearning to create beckons, we pay attention and cultivate it by making artworks, writing, singing, speaking, teaching, or… starting a new business! The yearning to create is the voice of our souls wishing to manifest itself in the physical world. Creating means loving the mystery, thriving on the process and surrendering to it. It is moving past the fear of what our creation will become and slowly but surely, embracing the process and incorporating it into our everyday life. When we create, we acknowledge our divinity and are Immersed in God! Original art measures 9"x 12". Size indicated is for matted and framed -See the alternate view.